“We thank the Lord brethren. We’ve been renewing the huts for our three sisters and their children. We’ve changed the roof with new iron sheets and removed the mud walls replacing it with iron sheets. 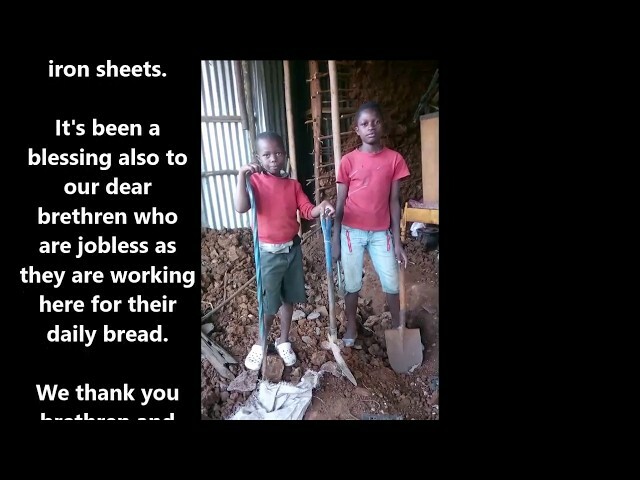 It’s been a blessing also to our dear brethren who are jobless as they are working here for their daily bread. We thank you brethren and our friends from Living Faith Christian Fellowship and all our sponsors for their contributions. Enjoy the video update below. "We thank the Lord brethren. We've been renewing the huts for our three sisters and their children. We've changed the roof with new iron sheets and removed the mud walls replacing it with iron sheets. It's been a blessing also to our dear brethren who are jobless as they are working here for their daily bread. We thank you brethren and our friends from Living Faith Christian Fellowship and all our sponsors for their contributions. Enjoy the video update below. May God bless you all in Jesus name. Amen.